Take advantage of predefined folders. Windows sets up some folders for you as libraries of content. 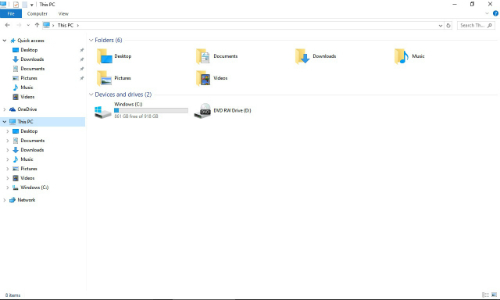 For example, the first time you start Windows 10 and open File Explorer, you find folders for Documents, Music, Pictures, Downloads, and Videos already set up on your computer (see the following figure). The Documents folder is a good place to store letters, presentations for your community group, household budgets, and so on. The Pictures folder is where you store picture files, which you may transfer from a digital camera or scanner, receive in an email message from a friend or family member, or download from the Internet. Similarly, the Videos folder is a good place to put files from your camcorder or mobile phone. The Download folder is where files you download are stored by default, unless you specify a different location, and the Music folder is where you place tunes you download or transfer from a music player. Create your own folders. You can create any number of folders and give them a name that identifies the types of files you’ll store there. For example, you might create a folder called Digital Scrapbook if you use your computer to create scrapbooks, or a folder called Taxes where you save emailed receipts for purchases and electronic tax-filing information. Place folders within folders to further organize files. A folder you place within another folder is called a subfolder. For example, in your Documents folder, you might have a subfolder called Holiday Card List that contains your yearly holiday newsletter and address lists. 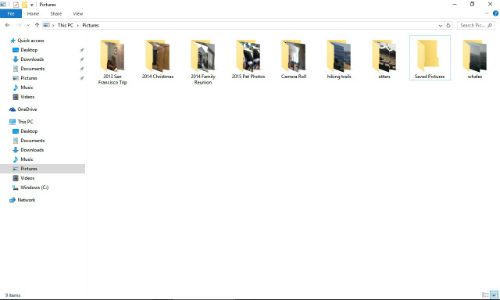 In the Pictures folder, you can organize the picture files by creating subfolders that begin with the year and then a description of the event or subject, such as 2015 Home Garden Project, 2014 Christmas, 2014 San Francisco Trip, 2015 Family Reunion, 2015 Pet Photos, and so on. In the following figure, you can see subfolders and files stored within the Pictures folder. Move files and folders from one place to another. Being able to move files and folders helps when you decide it’s time to reorganize information on your computer. For example, when you start using your computer, you might save all your documents to your Documents folder. That’s okay for a while, but in time, you might have dozens of documents saved in that one folder. To make your files easier to locate, you can create subfolders by topic and move files into them.